Tropical Disturbance Advisory Number A11 issued from RSMC NADI Dec 28/0831 UTC 2002 UTC. Tropical Cyclone ZOE 04F [890hPa] was located near 12.5S 169.5E at 280600 UTC. The cyclone has moved 05 knots over the last six hours and maybe is now starting to execute a clockwise loop. It is expected to later turn south. Position Good based on GMS EIR imagery with animation. 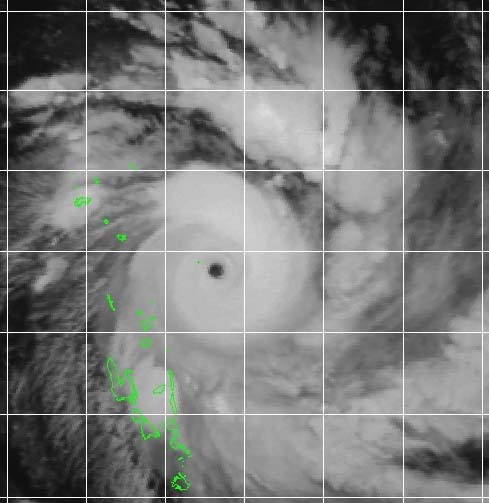 Maximum 10-minute average winds near the centre estimated at 130 knots. Zoe has intersified further over the last 6 hours, now having a T7.5 from a previous T7.0. Convective bands still wrap tightly around centre. Shear tendency [CIMSS] still shows a decrease. The cyclone appears to have reached peak intensity but given the favuorable conditions the possibility of further intensification is not ruled out. There is evidence of a weak dry slot wrapping in from the northwest. Outflow remains good in all quadrants. Zoe has slowed down in movement slightly over the last six hours and animated ENIR loop suggests that it maybe starting to execute a clockwise loop. It is difficult to assess the steering flow at this stage as Zoe, being so intense might be developing its own steering field. However, later Zoe is expected to gradually turn south, under the mid-level subtropical ridge to the south, assisted by an approaching upper trough from the west. South of 15S, SST decreases while shear increases. Available global models maintain the current intensity of Zoe but start to weaken the system when it acquires a more southerly track.